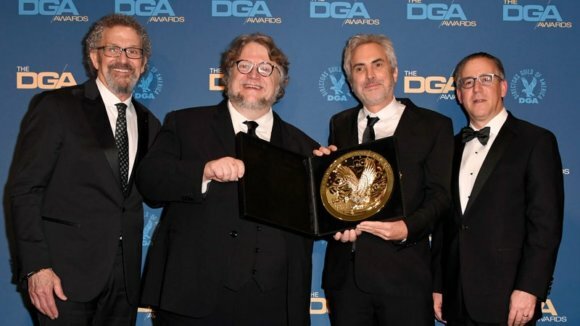 DGA President Thomas Schlamme, presenter and 2017 winner Guillermo del Toro, Outstanding Directorial Achievement in Feature Film Award-winner Alfonso Cuarón and DGA National Executive Director Russell Hollander. Roma director Alfonso Cuarón solidified his chances for taking home Oscars by earning the Directors Guild of America Outstanding Directorial Achievement in Feature Films award. The 2019 DGA Awards were presented on February 2nd and recognized the best in films and television of 2018. Among those on hand to celebrate the work of directors were Mahershala Ali, Yalitza Aparicio, Christian Bale, Paris Barclay, Linda Cardellini, Marina de Tavira, Guillermo del Toro, Sam Elliott, Tony Hale, Dennis Haysbert, Brian Tyree Henry, Ron Howard, and Viggo Mortensen. Sarah Paulson, Jordan Peele, Matthew Rhys, Keri Russell, Octavia Spencer, John David Washington, and Constance Wu also presented awards at this year’s DGA event. This was Mr. McKay’s second DGA Award nomination. He was previously nominated for the Outstanding Directorial Achievement in Feature Film Award for The Big Short in 2015. This was Mr. Stiller’s first DGA Award nomination. This was Mr. Horvitz’s nineteenth DGA Award nomination. He won the DGA Award for Outstanding Directorial Achievement in Musical Variety in 1997 for The Kennedy Center Honors. He was also nominated for The Kennedy Center Honors in 1993, 2001, 2009, 2011 and 2014. In 2013, he was nominated for The 55th Annual Grammy Awards and was previously nominated for The 70th, 71st, 72nd, 74th, 75th, 76th, 77th, 79th and 80th Annual Academy Awards, along with Sinatra: 80 Years My Way in 1995 and Live Aid Concert in 1985. This was Mr. Norman’s first DGA Award nomination. This was Mr. Jameson’s first DGA Award nomination. This was Mr. Jonze’s third DGA Award nomination. He was previously nominated in this category in 2006 for Hello Tomorrow (Adidas), Penguin (Miller Beer) and Pardon Our Dust (Gap). He was also previously nominated for the Outstanding Directorial Achievement in Feature Film Award for Being John Malkovich in 1999. This was Mr. Wardle’s first DGA Award nomination. This award is given in recognition of Distinguished Achievement in Television Direction. This award is given to an Assistant Director or Unit Production Manager in recognition of career achievement in the industry and service to the Directors Guild of America. This award is given to an Associate Director or Stage Manager in recognition of career achievement in the industry and service to the Directors Guild of America. This award is given for the network’s commitment to, and leadership in, inclusive hiring in DGA-covered categories – and for the example they set for the rest of the industry.